Palakollu is located in West Godavari district of Andhrapradesh in India. Thhis place is famous for Lord Shiva (Eshwara) temple which is considered as one of the Pancharama temples. The temple here is called Sri Kshira Rama Lingeshwara swamy. Excellent transportation facility available to reach Palakollu. Very good service available for trains and buses from other places of India. One more Pancharama Kshetra called Bhimavaram is located just 20Kms away from Palakollu. One more major city of West Godavari called Narsapur is 25Kms away from here. Very frequent buses run towards Narsapur from all other parts of Andhra Pradesh (by APSRTC). 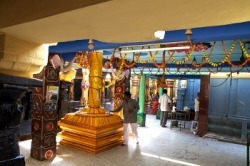 The temple is situated very nearer to Bus station and no additional transportation is needed. The temple is located beside a very narrow road. Palakollu is 20Kms from Bay of Bengal. The main attraction of Palakol is the temple dedicated to Lord Shiva, Sri Ksheera Rama Lingeswara which is considered as one of the Pancharama Kshetras. 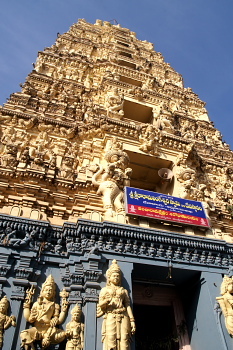 The height of the temple is 120fts and constructed during Chalukya period by Chalukya Bheema. The construction took place during 9th century. The lingam, which is white in colour, is believed as the tallest. There are 72 pillars made of black stone. 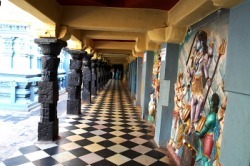 Inside the Garbhalaya (Garbha Gruha), Gokarneshwara and Vigneshwara (Ganapati) alayas are situated at the left with Kshiralingam located at the center. 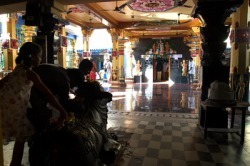 To the right, Subramanya Swamy and Janardhana Swamy alayas with Nandi at the centre are situated. Gostani river flows through the town Palakollu and there is a sangam place near Narsapur with river Godavari. From here the river enters the sea at Antarvedi. Once upon a time this place was a thick forest with natural greenary. The Shiva Lingam (Moola Virat) can be seen from all the four sides through windows in the Garbha Gruharam. Additionally, Sun God, Kashi Vishweshwara, Goddess parvathi, Goddess Lakshmi, Nagareshwara Lingam, Dundi Vigneshwara, Veera Bhadra, Sapta Matruka, Kanaka Durga, Brahma, Saraswathi, Kumara Swamy, Kartikeya, Mahishasura Mardhini, Naga sarpa, Nataraja, Dattatreya, Kala Bhairava, Nageshwara, Shaneeshwara, Shankara, Radha Krishna can also be seen in the temple. There is a belief that the Shiva lingam is installed by Lord Vishnu. People say that, staying one day in Kshirarama is equivalent to staying one year in Varanasi. 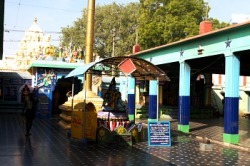 The Prakara is designed by Sri Velupathi during 10th century. The art of temple construction resembles those constructed during Chalukya period. Palakillu is on the National Highway 214 located at interior Andhra Pradesh. The highway starts from kathipudi (on National Highway 5) near Annavaram and ends at National Highway 9 between Vuyyuru and Machilipatnam. Very frequent buses available to Palakollu from all parts of Andhra Pradesh moving towards Narsapur or Bhimavaram. People travelling by road from Kolkata and Orissa side, have to reach Visakhapatnam and proceed in NH5 upto Ravulapalem. After Ravulapalem, take left turn where the boards points towards Narsapur. Palakollu is just 45minutes journey from this place via Siddhantam and Martair (Marteru). The distance between Ravulapalem and Vizag is 230Kms and 70Kms from Rajahmundry. There is an Alternate way to reach Palakollu from Visakhapatnam. Proceed upto Kathipudi on NH5 and take left turn. Reach kakinada in this route and proceed towards Rajole via yanam and Amalapuram. From Rajole make your journey towards Palakollu. From Kakinada, one can reach Palakollu via Ramachandrapuram and Ravulapalem also. There are only two bridges to cross River Godavari one at Yanam and the other near Ravulapalem. People travelling by bus from Hyderabad, Vijayawada and other parts of the country can travel upto Tanuku on NH5 and take right diversion to reach palakollu. Not all the trains reach Palakollu. Trains running from Kolkata side take left diversion at Nidadavole to travel towards Palakollu via Bhimavaram (junction). Some trains proceed towards Vijayawada from here via Kaikalur. After Palakollu, trains reach the last station Narsapur. Confirm before booking the tickets for stops at this station. Tourists get down at Bhimavaram and take private vehicle or travel by bus to reach Palakollu. The total time of journey from Visakhapatnam to Palakol is 7 hours by bus. Private bus transportation exists between Narsapur and Bheemavaram via Palacole. The temple timings are, 5.30am to 11.30am and 4.00pm to 8.30pm. Additional places of interest around Palakollu include Bhimavaram, Draksharama, Annavaram, Thalupulamma Thalli, Rajahmundry, Antarvedi, Ryali and Vadapalli. In the temple premesis choultry facility is available for tourists to stay. Photography is allowed inside the temple premesis but for Garbha gruham. Very good South Indian food is available in the town.